Hello, my name is Pet Crazy. OK, so maybe not really. My real name is Ann Staub. 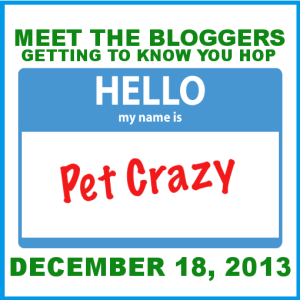 Today, I'm joining other pet bloggers in a fun little "Meet the Blogger" blog hop. 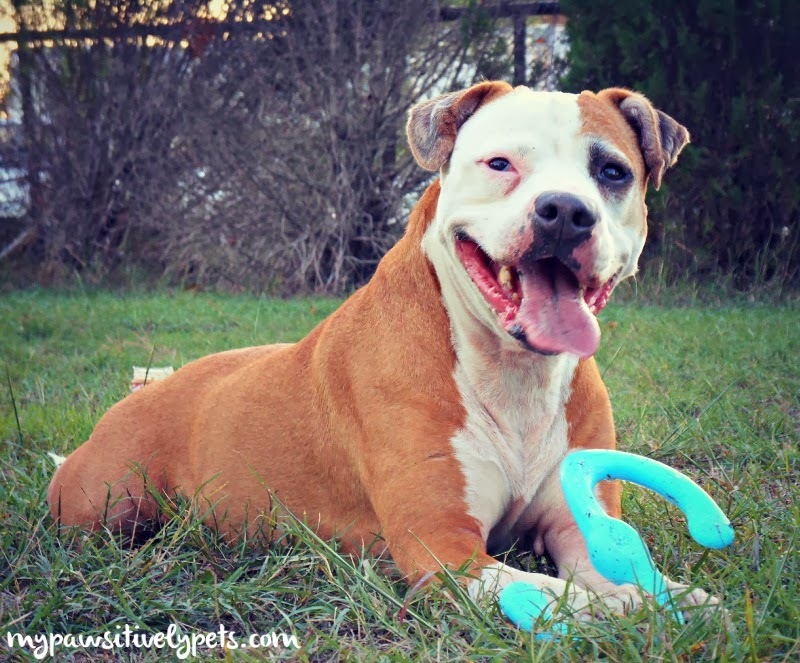 I read about this event over at NEPA Pets. 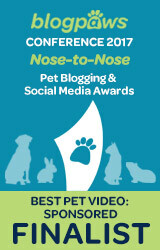 Aren't you curious about who writes all of these fabulous pet blogs? It's OK to be a little nosy, sometimes. So I guess that means I am going to have to share some stuff about myself. First of all, there are a few questions I'm supposed to answer about myself so that my readers can get to know me better. Let's do this! What’s your favorite non-animal related book? I don't read much. I just don't have the time. I may get some of you shaking your head at me for this, but I loved Twilight. Even though it has werewolves in it, I'm classifying it as non-animal related. I also really liked the Hunger Games. What’s one thing you have to do every day? I have 2 daughters, one of which is in elementary school. So everyday I have to go and pick her up from school. You wouldn't believe the "pick-up" car line at these elementary schools where I live. Are they ridiculous in other places too? 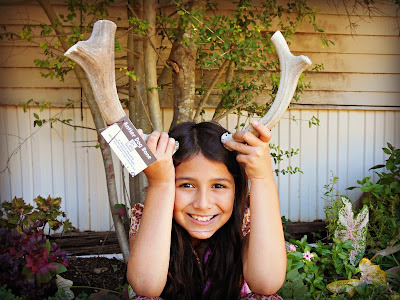 My oldest daughter helping me with a product review. What do you wish you were more skilled at? I always think of skills in terms of my job or work. When I worked as a veterinary technician, I always wanted to learn new technical skills like intubation, cystocentesis, urinary catheter placement, etc. As a blogger now, I would love to improve my photography skills. One of my favorite photos of Shiner. What do you like to do in your free time? I don't have much free time actually, but I do like to cook. Naps are nice too. I used to be big into playing video games, but don't have much time for that these days. My game of choice was an MMORPG called Final Fantasy XI and I played it for about 7 years. Someone made this for me. That's what my character looked like on the game. It's a cat! What is one thing you’ve done that you’re most proud of? It's too hard to choose just one thing! Of course, I am extremely proud of my blog and where I've been able to take it in just over a year's time. I'm proud of what I've been able to do with no prior experience in the blogging world! My first Blogiversary was in October. 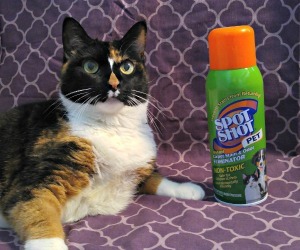 What drives you nuts about your pets? What melts your heart? Shiner's stubborn attitude gets to me sometimes. She has selective hearing and I swear she thinks it's funny when I tell her to get off the couch and she doesn't. I love it when she is excited to see me when I've been gone. She has the biggest smile! 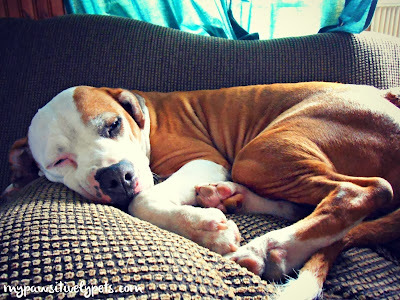 Shiner's favorite spot - the couch. If you didn’t have your current pets, what pets would you choose to have? Um, I'd probably have a whole zoo! No, but there really are a lot of pets on my "want" list... including guinea pig, parrotlet, lineolated parakeet, cat, and bearded dragon. 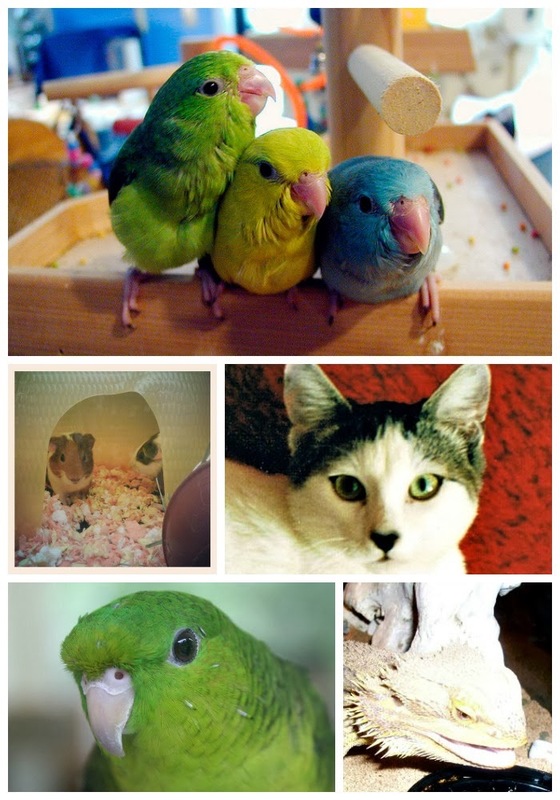 Clockwise from top: Parrotlets, Cat, Bearded Dragon, Lineolated Parakeet, and Guinea Pig. If you'd like to know more about me, you can visit my "About Me" page. It explains more of my story and how I actually became a blogger. You can also see all of my pets and their bio's as well. If you still are curious about me, feel free to leave a question in the comments! And be sure to stop by some of the other fabulous bloggers participating in this event so you can learn more about them too! I just saw Melissa's too...it's so much fun to learn more (and see more) of the human behind the blog! Thanks for sharing so many fun things about yourself! Hi Ann! :) Here's my question: is that the same pink wig I loved seeing on Shiner?!? Thanks Doni! I've played almost all of them except for maybe the newest titles. It is a fun hop, not that I don't love all the info about everyone's pets, but it is nice to get a glimpse of the people behind that! Have a great day. Love the pink wig...way to bring out the real you! Thank you! I love my pink wig too :) But haven't worn it in a while. Great to meet you Ann:-) Such a fab idea for a bloghop! Hi Ann! Long time no see! This post actually made me bark for more! seriously, it was like meeting a good friend all over again... was so busy, couldn't come here as often as i would've wanted to, so reading this made me realize i have to come back more often! Hi Lulu, no worries. We all get busy sometimes myself included! I will have to stop by to visit you too! Nice to "meet" you LOL You really would like to have a bearded dragon? Your blog is great, you can be really proud. I learnt a lot from your posts - THANKS! Oh yes Easy! Actually, I've had a bearded dragon. Kind of. The one in the picture is my brother's and he lived with me for several years. He is still alive but lives at my brother's house. I'll have to write about him sometime. Plus, I worked with tons of them at the vet clinic and they are such nice lizards. I sure enjoyed learn more about you!!!! Peeps loves cooking too and she says I have a bad case of selective hearing. Nice to learn more about you. sew if ewe getz a bearded dragon...will him knead ta shave everee day ! I bought Zelda for 3ds a few years ago. It was the first time I had played a Zelda game ever - can you believe that? I've played all the old FF games though. I just read on BlogPaws that the hop is going to go on through the holidays. You should bark at her to join Miss Dolly! I am shy too Dolly, so no worries! You are very pretty! Nice to "meet" you! Nice to meet you on the hop! Good to see all the love the Hunger Games are getting with fellow bloggers - I liked the movies and asked for the books for Christmas, so I hope they live up to expectations! Hi thanks for visiting! I read the books first but haven't seen the 2nd movie yet. The books are definitely better! But the movie isn't too bad compared to it. Unlike the Twilight movie which was rather disappointing. Great to learn more about you! I don't have kids, but I do sometimes come home from my volunteer gig at the same time a couple of schools are getting out - and their pick up lines are insane! I always try to remember to leave the shelter a little early so I don't get stuck in the traffic! I think these schools have some major parking issues! They have people parking on the side of the street around the school. They're always barking about safety, but that just doesn't seem safe to me. They have a parking lot that's 75% empty but people aren't allowed to park in it. What the heck?! Just venting because it so bugs me! I just love your first picture of Shiner. It's adorable and looks like a professional portrait. Thank you Pamela! I love that photo too. Unfortunately, that camera is now broken so my pictures haven't been as good lately. Great post! It was nice getting to know you better! So nice to meet you and what a great idea this was. I love meeting the humans behind the animals. Great post! I applaud anyone who can keep up with both children and a blog. That is a lot of work. Children take up a lot of time and energy on their own (but they're worth it). That is an awesome photo of your daughter. Congratulations on all of the achievements with you blog! I didn't really have any blogging experience before starting Playful Kitty back in September either.It has been quite the journey. I have another daughter too, and she's almost 2. She's the one that is really hard to keep up with! Hi Ann! :) Nice to learn more about ya! 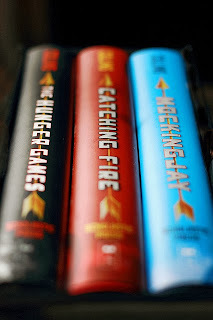 I'm also a fan of the Hunger Games (book 3 not so much) and I love playing video games too! And to answer your question - yes, those lines are nuts everywhere! I live across the street from an elementary school so I know! Great post Ann, I never knew about the meet the bloggers blog hop until now I will try and get a post up later. I hear that it's going on for much longer than just today, so take your time! Whoa! I know more about you than I do about TW. I thinking whether I should give my blog over to her for one day. MOL, I think you should CK. TW seems very mysterious to me! Would love to know more about her. Hey Ann love getting to know you better! This was a really nice idea. 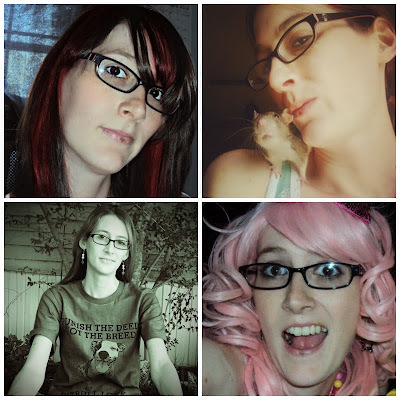 Love all the photos too, especially the one with the PINK hair. Love it, love it, love it. Same here. I read them right before I began my blog and finished them in like... a couple of days lol. I bought them because I was always so bored, so I thought I'd give reading a try. Blogging keeps me far too busy for much reading now! selective hearing is a huge talent that we dogs try to prefect! Wonderful to meet you and we do love your blog! Hi Maggie, you dogs can be VERY good at it too! Great answers, Ann. I could definitely picture you with a whole menagerie of different pets! Love the photos, great variety of serious and fun in there! Hi Ann! It's great to get to "meet" you! I've been wondering who the person behind that picture of you really is! Wow, a 2-year-old! You MUST be busy! My older grandson is going to be 3 in February and he keeps his mama on her toes 24/7! 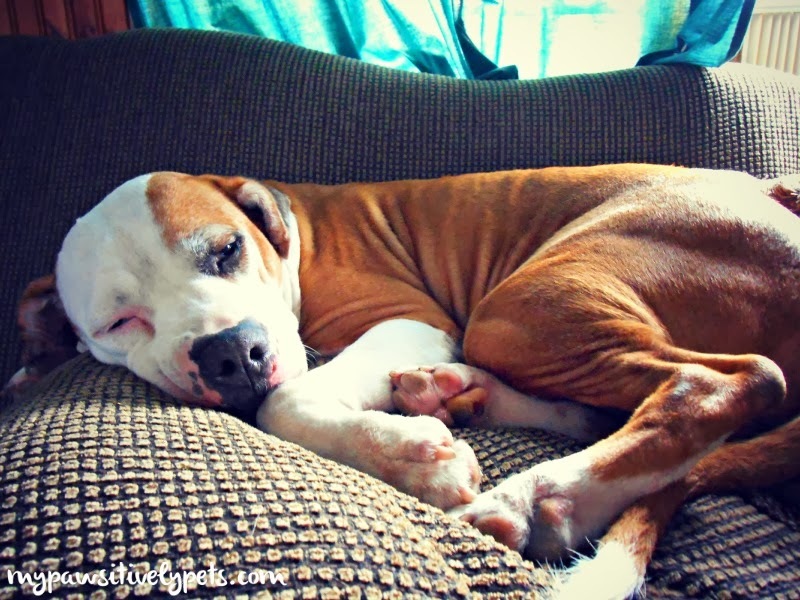 And now he has a baby brother (4-1/2 months old), so my poor DIL is thankful for every nap the boys take! And, yes, the parking lots and traffic around the elementary schools here where I live are insane too! Whatever happened to putting the kids on school buses like when I was their age up on Long Island? I love your answers! Next year some time I plan to start the Vet Assistant course with the Animal Behavior College. At my age -- 60+ -- I don't really have any plans for full-time employment any more, but it would be nice to have the knowledge so I can NOT panic every time one of my 3 dogs hurts herself! And my vet has already said he'd be happy to have me working for him during the externship portion of the program. I'm not sure I would want to become a Vet Tech, but I do want to have a better understanding than I do now. I feel it would benefit my dogs as much as it would me. Well, when I have more time (after the holidays, I hope), I'll stop by your blog again. I think it's absolutely amazing that you are going to college at your age for the vet tech program! You should have a lot of fun and learn many new things, even if you don't work as a full time vet tech. It can be a pretty exhausting job sometimes. Hope to see you again! You guys are in my blog reader so I will have to stop by later on this evening hopefully! Really enjoyed reading more about you, though the human's glad she missed having to do it herself... coward!! MOL I would love to know more about your human Austin! She also seems very mysterious ;) There is still time you know! I know cats make awesome pets! I've always had cats growing up and even as an adult, so I think that I am going through cat withdrawals right now. So much to read about so many blogger humans, it's great! This hop was an awesome idea! Thanks for sharing! It was cool to get to know more about you. LOL at you would probably have a whole zoo. I think I'd just get another dog. I'm starting to fall in love with french bull dogs! Those Frenchies are so super cute! But quite expensive. I can see how you'd fall in love with them. Exotic pets are kind of my passion, so that's why I'd like a zoo! Hi Ann! Love the pink hair and your daughter's antlers. Cute! I've always wanted to get into Final Fantasy and other role playing games but never had the time. I tried to get into live action role playing, but again couldn't find the time. I've never even played D&D, but have always wanted to. Very cool Dawn! FF can be extremely time consuming... especially if you play online. There is just so much to do in so little time. Especially since they changed the game so much after I stopped playing. My boyfriend still plays though. This blog hop is so neat!!!!! I love it!! Its great to get to know you better Ann! I usta be obsessed over video games too (when I had the time to play them) lol!! They can be so fun sometimes lol... Sometimes I think about playing the Sims again. That was a fun game! First of all, congrats on your blogiversary! Your babies are too cute celebrating with you! Thanks for joining in, this blog hop is so much fun - it's great to get to know you!! 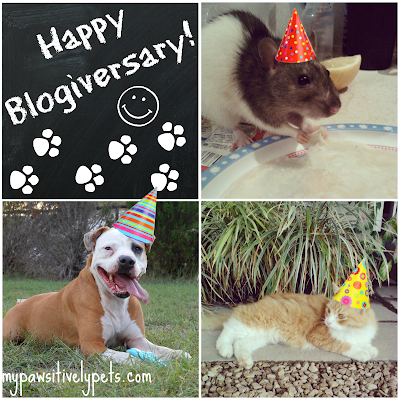 Hi Julie thank you :) My Blogiversary was back in October and it was a lot of fun to make it to the one year mark! Hi Ann~ It's nice to see you and learn more about your everyday life. You probably hear this a lot but you'll appreciate someday...you look soooo young! Oh, and very pretty just like your daughter! Yes, having worked the "bus circle" in a K thru 8 school pick up and drop off lines are insane! And just like on the movie "Mr. Mom", someone ALWAYS does it wrong! LOL! I do get that a lot... I have people asking if my daughter is my sister lol... I am young, 29, but I'm not THAT young. It's a bother to be carded sometimes too! THAT PINK HAIR _ LOVE IT! Great to meet you and happy belated Blogiversary! Great photos, especially love you with the pink wig! Cool! My server was Asura, so I don't think I recognize that name. These posts are so fun, and I must say that your photos are awesome. You're a great photographer. Thanks Lori! I have noticed my photo quality has declined just slightly since my daughter broke my new camera. I've had to resort to using the old one, which isn't too bad. But I can't seem to get the greatest photos when I'm indoors with it. Woohoo! Yay for more Twilight fans lol. Awesome post! I loved reading your answers and learning more about you - so glad you joined us on the hop! I don't read much either Ann. So many bloggers in the hop say "I love reading" but I really don't. I mean, I DO read. They are usually business books or ones that teach you things. I just don't have a lot of time to read. When I have free time I have a ton of other things I would rather do with it. Wow, I think you took the words right out of my mouth! There are a lot of things I'd rather do with my time too... I will read a book when I start getting bored and need something to do. And if it's not a book that I REALLY like, I have a hard time reading it. But, if I do like it then I will finish it by nonstop reading in like a day lol. 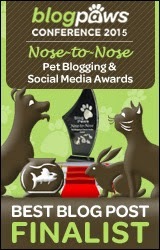 Pawsitively great blog hop! Love it! This is certainly drawing me in closer to reading more blogs. I am sure a lot of other readers will agree. So nice to have a human side to the picture. I am new to reading blogs and I had no idea that there were so many. I must add I knew I liked you from the very first My Pawsitively Pets blog I read on Google+. Must go read blogs. Keep thinking pawsitive! There are so many wonderful blogs out there. You should definitely check them out!